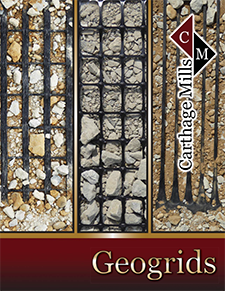 Geogrid products are designed primarily for reinforcement and, characteristically, are integrally connected to elements separated by in-plane apertures. Contrary to geotextiles, geogrids are netlike materials with large open spaces called "apertures" which are typically 0.5" to 4.0" between the ribs. Although geogrids are used primarily for reinforcement, some products are designed for asphalt overlay and waterproofing or for separation and stabilization. Geogrids also are used as gabions and sheet anchors, inserted between geotextiles and geomembranes, or used to construct mattresses for fills or embankments over soft soils.